Today was quite calm and relatively warm, so I took it as an excuse to get out of the house for a longer hike around this northern end of the island. 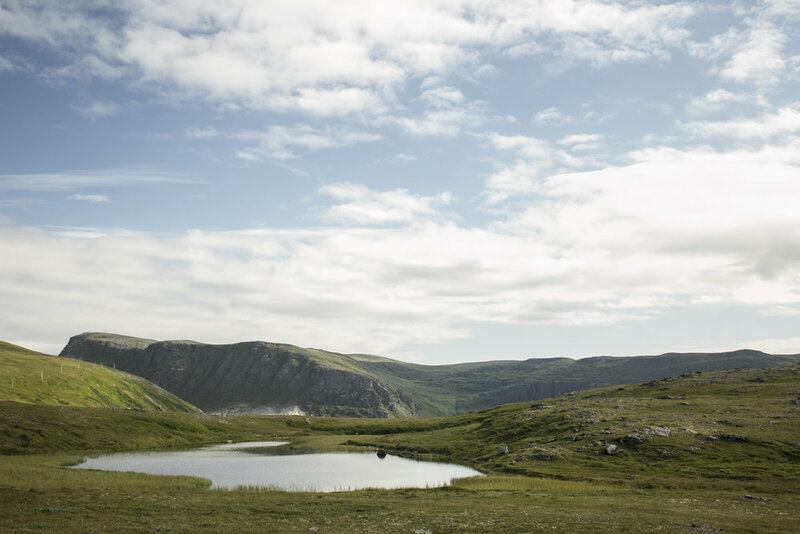 Sørøya is Norway's fourth largest island so without the ferry and a lot of spare time, it's not possible to get around the island in its entirety. I spent about 5 hours in the afternoon walking a large loop towards the coastline along the back/northern side and back down into Akkarfjord. The mountains might not be nearly as vertiginous as the Lofoten wall, and the fishing villages aren't quite as postcard-ready as the clusters on Moskenesøya, but I don't think Sørøya ought to be that quiet compared to the explosion of tourists crawling all over Lofoten. The scenery here is still stunning, and perhaps more picturesque without so many people accidentally getting into frame. After bypassing some dramatic rock formations, I was accosted by a pair of Jehovah's Witness'. On top of the camels, the other thing I just had no anticipation for was travelling missionaries. They looked like hikers from a distance, but one of the girls stopped me and quickly whipped out a tablet to show me a 'short film'. My bogus travelling grin quickly slackened when I made the realisation, but I still had to endure some grilling about my beliefs and opinions on the state of the world. Needless to say I did not pick up a brochure. After that and another sheep farm, I eventually arrived at Sandfjellet [sand mountain]. It's quite literally a sand mountain, as the mountain spine running along the island abruptly turns into an enormous sand dune before it terminates into the ocean. The dune is incredibly high and steep going down, and I can't imagine any average person having an easy climb back up. Fortunately the sand is quite soft and fine, so I had an exhilarating sprint/slide down the dune - partially on my feet and partially on my bum. My return back to the house would have been faster and more straightforward had I not then lost my lens cap. I've been so careful with not leaving anything behind me, but it must have slipped off as I was hurdling a brook or ravine. I left my bag on the path to retrace my steps to try and unearth that stupid cap, but to no avail. What was worse was then not being able to find where I left my bag. As with all Norwegian hiking trails, paths are barely noticeable and often just peter out or branch off into dead ends and alternate tracks left behind by other wayward hikers. The shrubs I had parked my bag under just looked like every other nondescript patch of shrubs, and I spent maybe a good hour running in circles like an idiot. Some nearby campers were probably half scared and half confused as they watched my backtracking, and eventually Wendy (fellow artist) caught up to me as well. I told her to go on without me and eventually located the bag, but without lens cap. I caught back up to Wendy and we bypassed a supposed DNT hut beside a lake on the way back to town. As its Sørøya, there's no queue of tourists and hence no need for special keys. Inside was simple but cosy - ideal for a night off-grid if I feel the need. Obviously there'll be a blog post about it if that ever happens. Arriving home my legs felt pretty sore, but that was partially forgotten when dinner was ready and waiting - meatballs, brown sauce and mash.